Jesus, this post made my brain hurt. Don't think I've used some of those brain cells since I don't know when. 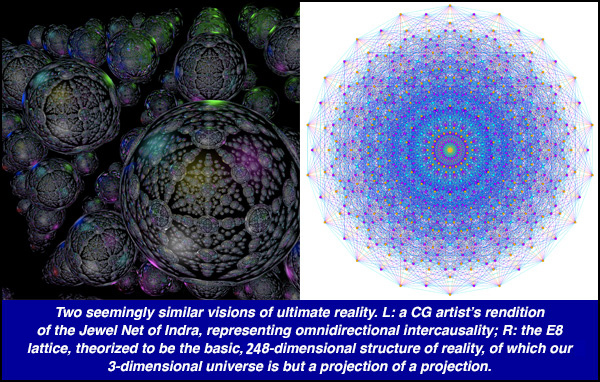 Seriously, I've never even heard of these reality concepts before. It might take all of the new year to get my mind around them. The fact that your post makes me WANT to do so says a lot. Good work, Kevin! There are a lot of heady ideas in the video, along with some kookiness about the link between consciousness and matter, but the video has what is easily one of the clearest explanations of E8 theory I've ever come across. The second video, which I linked to at the bottom, does an even better job of exploring E8 theory, and it includes interviews with E8's main proponent, genius surfer dude Garrett Lisi.